A restful sleep had us up at 6:30 am with a quick decamp and light breakfast. Like the travellers before us, we left an offering of tobacco, asking for a safe passage for the upcoming week. By 8 o’clock, our canoe was loaded with provisions and set adrift, gliding amongst the morning mist on George Lake just as the sun’s rays fought through the sparse clouds beyond the tree line. As we felt the tug of the wind and water, we soon developed our own acute sense of ourselves, and our connection to nature - it is said that canoes and spirituality are inextricably linked. We ferried our craft through the quartzite channels where we caught up to two kayakers enjoying the scenic landscape on route to Killarney Lake for the day. At P1L80 (lake surface elevations = 189m to 192m), we were surprised at the sight of a wooden dock just below a beaver dam. We enjoyed a panoramic view of George Lake from the top of the dam, even though the smog inhibited the clarity of the distant ridge and forest. A cluster of trees on a knoll provided an excellent overview of Freeland Lake and its shallow, swamp waterway. Its main channel zigzagged amongst the lily pads, waterlogged stumps and islands of dead lilies on masses of floating earth. 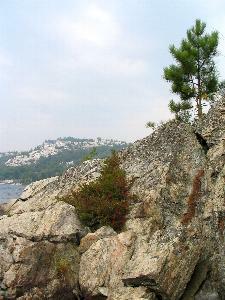 The P2L455 (192 to 200) trail of jutting rocks and protruding roots inclined slightly and then leveled out to Killarney Lake. The kayakers we had met earlier now rested at the end of the portage. 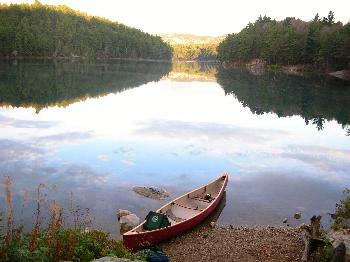 As we prepared our canoe for departure, the increasing temperature and humidity caused us to perspire profusely. 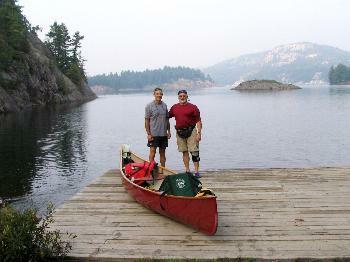 A middle-aged couple in a Langford canoe arrived at the portage on their way out after an enjoyable stay on Killarney Lake for the night. Shrieking heat bugs warned us of a much hotter afternoon. We paddled in tandem, quiet, respecting each other’s need for solitude. We rounded a point and entered the expanse of Killarney Lake, coming face to face with white and red quartzite ridges and occasional sloping gneiss – the aura of the place held us in its grasp. The rugged, steep cliffs were impressive, rising abruptly from the crystal, clear aqua shore and ending in plateaus flanked by boreal forests. In the distance, canescent rock on the ridges took on the appearance of deep snow. It was astounding to see the life that strived, the trees and plants and lichens that somehow found a way to grow on this enduring, lifeless stone. This, combined with windswept coniferous trees and islands dotting the lake, was absolutely breathtaking. 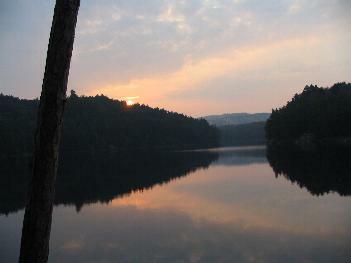 The La Cloche Mountain range definitely showed its geological history that dated back billions of years. We caught a light breeze on the open lake, lost in time. The sun’s rays cast a blinding reflection on the rippling water surface, hindering our sense of navigation. 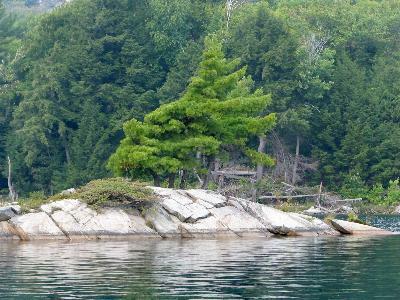 We slipped behind a small island near the end of the lake and beached our canoe into a nook of a cove – a stepped ledge at campsite 15 easily enticed us for a refreshing swim. 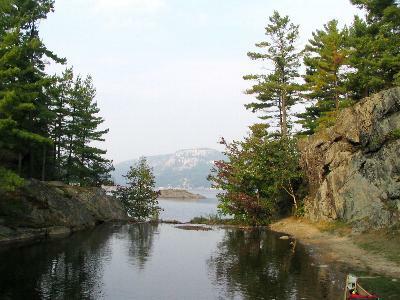 Norm swam across the cove and climbed upon a narrow peninsula to acquire a better view of the westerly sector of Killarney Lake. 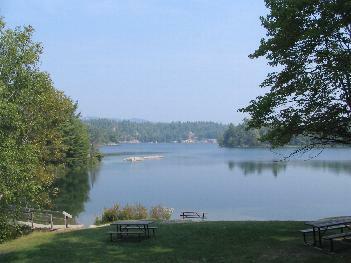 At the end of this outcrop, a single wind-sculpted white pine characterized the harshness of the westerly winds on this open lake. Killarney Lake had to be one of the most panoramic, geological lakes we have ever paddled. At the end of the lake, we drew and pulled around several sleepers and stumps searching for the circular portage disk, only to come upon a banked beaver dam. 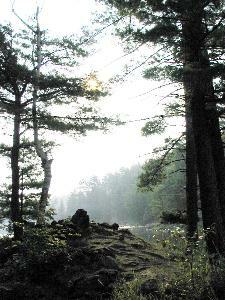 Low-lying terrain was evident on the other side; however, from studying the park map, the portage trail was located elsewhere. We backtracked into another inlet and located P3L1390 (200 to 205) amongst the trampled yellow sedge grass, its trail leading us to the tree line where we slipped into the dense, cool woods. We carried our largest backpacks for twelve minutes to the halfway point and then returned for the smaller backpacks and canoe. The heat and humidity took their toll on us – sweat poured off our faces and trickled down the small of our backs - far too much fluid lost for the amount of water consumed. Dehydration was a concern and we rationed our drinking water for the remainder of the portage, drinking lesser amounts but more frequently. It was imperative we maintained our stamina and resilience; otherwise, we would pay the price later in the day. The air was cool and pungent within the confines of the forest, the sun occasionally breaking through in bright, dusty columns and, in so doing, revealing an abundant sprinkling of mushrooms and fungi throughout the area (click to view photos). A serpentine waterway would occasionally come into view along a stretch of wetland adjacent to the trail – the question of whether we should have paddled it rather than portage, kept taunting us. On the second half of the portage, we met four hikers from campsite 14 heading towards Killarney Lake. On a day-trip outing, they had crossed over the previously mentioned beaver dam, paddled and left their canoe at the end of the wetland, and were now trekking the portage trail for pleasure. Our instincts told us to continue portaging through the woods, as we were a short distance away from Norway Lake. 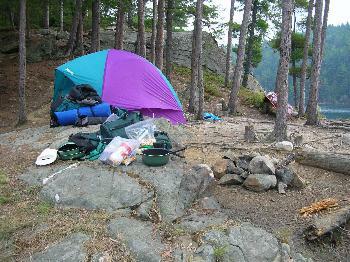 To our disappointment, we discovered campsite 11 on Norway Lake was occupied. Campsite 13 was located on an outcrop amongst a thick stand of pines and spruce adjacent to the wetlands – camping here would have us face an early nightfall without a sunset and the possibility of an infestation of mosquitoes. The contour lines on the park map indicated our next portage to Kakakise Lake the following morning would involve a horrendous uphill climb. Campsite 12, although rock sloped with well-spaced spruce trees precariously clinging to its sparse soil, was located near the portage entrance – it would be our most logical choice. Open to the elements, we were vulnerable to any change in the weather; however, we had to take our chance. The campsite offered limited space for a tent pad; however, there was an ideal landing, a campfire next to a large slab of stone that acted as a kitchen counter, clear aqua water for swimming and a fantastic westerly vista of a white quartzite ridge beyond the channel. Next to our campsite, we spotted a beaver leisurely swimming undaunted across the channel, a long, lazy V spreading over the smooth evening surface. Suddenly, it turned in our direction and passed in front of our beached canoe, oblivious to us standing along the shore. At a higher elevation, we took note of the beaver sneaking below the waterline with the usual warning splash of its tail. For the next minute or two, we watched him swim along the clear lakebed searching for food or trying to evade our presence; then he was lost from view and not seen again. The shoreline held an abundance of firewood and, at our next portage, we realized it would be unnecessary to wear our boat shoes the following morning as our hiking boots would be sufficient to disembark without getting wet. As a result of our day’s exertion, both of us encountered early symptoms of dehydration that were counteracted by drinking additional water and consuming nourishments. 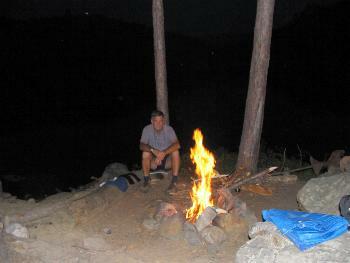 That evening, we enlisted a survival technique with Norm using half a dozen corn chips as a starter for the campfire – the oil in the corn chips acting as a fuel while the remaining chips were Wayne’s late night snack. The shrilling pitch of the heat bugs was a constant reminder throughout the evening and, when the sun descended over the horizon, the loons began their banter to one another in the narrows. Sleep came early and without complaint.